My second Dining In article appeared in last week’s whatzup. I am really enjoying the opportunity to write about food for the local publication and I’ve gotten a great response from the community too. If you’d like to read it, click <<HERE>>. 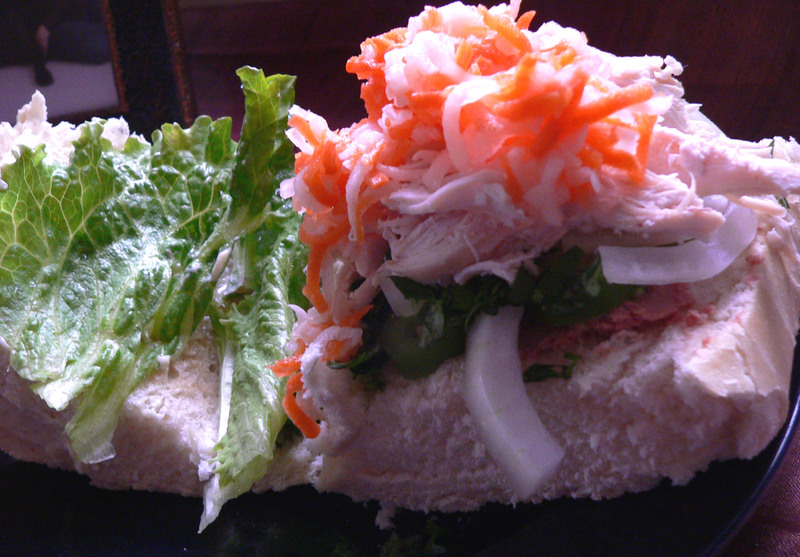 It features Banh Mi, a Vietnamese Sandwich- recipe below. Shred daikon and carrot in a food processor fitted with medium shredding disk. Stir together vinegar, sugar, and 1/2 teaspoon salt and toss with shredded vegetables. Let slaw stand, stirring occasionally, 15 minutes. Meanwhile, heat baguette on rack in oven until crusty, about 5 minutes. Cut off and discard round ends, then split baguette. Mix together oil, fish sauce, and soy sauce and brush on cut sides of bread. Spread liverwurst on bottom layer of bread and top with chiles, onion, and cilantro. Drain slaw in a colander.